The Children Of Palestine Speak Truth To Tyranny. 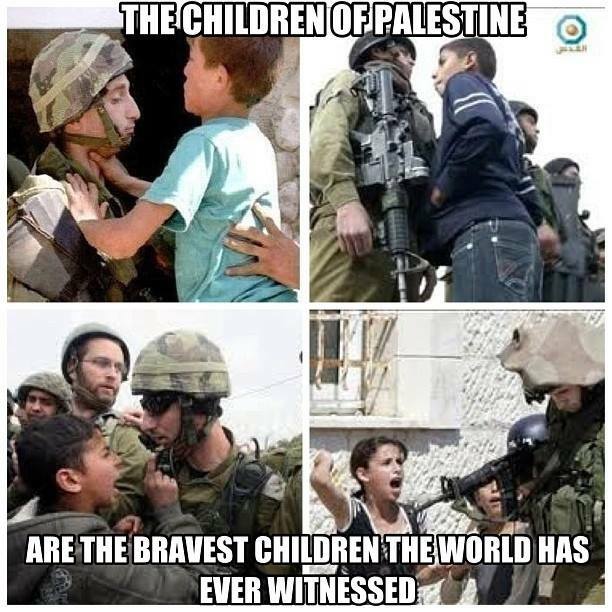 The children of Palestine are the bravest children the world has ever witnessed. They defy the soldiers of the zionist occupation regime. They stand between their brothers and sisters and pointed weapons. They protect their parents and grandparents. They complain, they argue, they remonstrate, they demand. They speak truth to Israeli war criminals, spit in their faces and scream in anger. All too often, they die, in agony, for life, for Palestine. « The Silence Of UK MPs On Gaza Is Shameful. Oh really, are you sure it’s not that Palestinian parents are biggest pussies the world has ever witnessed. Sending their children to throw rocks, what kind of a coward does that? Do you know what would have happened to these children had it been Iraq, Afgan or Vietnam and these soldiers were Americans? They would be shot on the spot. The children wouldn’t even be able to get close to the army personal, let alone try to lay a finger on them. However, for some reason US doesn’t get any condemnation from the UN. Strange hu? (what about their Shock and Awe tactics in Iraq? Nothing on that? Ok) How do I know that’s not what happened in Israel, right after these pictures were taken? Cause Pallywood wouldn’t miss a chance to show off another dead child, and play on the public’s feelings once again. Had it been the case or had the soldiers shown any sign of response, those would be the pictures you would be looking at right now.